Looking for Outdoor Cable Protectors? 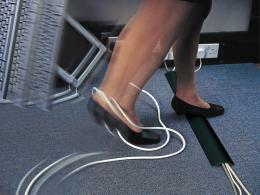 Trips and falls account for most office accidents. These accidents can lead to time missed at work and insurance claims that can be hefty. By using a few preventive measures and a checklist provided by the Health and Safety Executive, the workspace can be up to code. Included on the list are cable covers that are outstanding for managing cords and clutter. 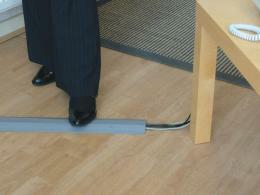 There are several types of cable protectors available for everyday use in any indoor space. An affordable solution is the Universal Budget Internal Cable Protector. Construction of the product is derived from a 9m high grade flexible PVC. 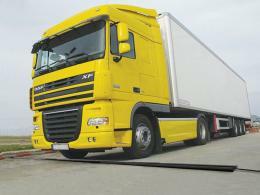 The cover has sloping edges that will easily allow for carts, trolleys, and hand trucks to glide over the unit. 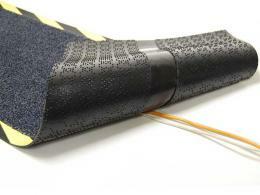 The wide central chamber allows for different size cables and the cover is fire retardant. For additional space, the base can be slit. You can cut the protector to any length, which adds to the value. The Snap Fit Internal Cable Protector is available in black with a hi visibilty yellow insert and can blend with any décor. 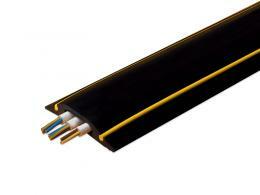 This product can be used in any environment for loose leads and cables. There is not an unpleasant smell due to the rubber. Safety features include the protector being fire retardant to BS476 Part 7 Class 3 and is non-conductive to BS903-C5 500V. Construction of the cover has sloping edges that will allow for carts and trolleys to move over with ease. Messes are easy to clean off of the cover and different lengths can be obtained through cutting. Construction of the protector is derived from polymer and meets safety standards, like being fire retardant to BS476 Part 7 Class 3 and has been tested to non-conductivity to BS903-C5, 500V. Cable Snakes are outstanding for keeping unsightly cords at bay. The cable snake can be removed and used again. 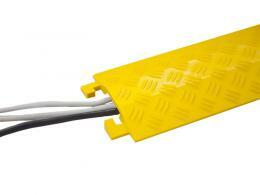 The product can be cut to the needed length and will hold up to 6 cables. Flexibility is key with the cable snake and can be used in a wide variety of spaces, like behind electronic devices or at power supplies. A zip tool is provided with all cable snakes. Having cables properly taken care of will ensure the safety of employees and will prevent accidents. We offer a wide variety of office cable protectors that will prevent falls and trips from occurring in any work environment. Any budget can be met and we only offer high quality products that meet all safety standards. Ensuring your employees are safe will lead to a more productive work area.